A vocal polyp that looks like a “blood blister” on the vocal cord. A hemorrhagic polyp may occur because of acute vocal trauma—sudden and extreme overuse of the voice—and may result in abrupt and fairly severe hoarseness that is persistent. In time, the blood may resorb and leave a translucent polyp; this kind of polyp may be prone to re-bruising intermittently. Small hemorrhagic polyps may heal on their own, but usually require many months to do so. Larger hemorrhagic polyps should be surgically removed. Fortunately, with hemorrhagic polyps, the prognosis for full recovery after surgery is excellent. Hemorrhagic polyp, right cord. Notice the “blood blister” appearance. Recent further bleeding evident from yellowish discoloration of upper surface of the cord, due to breakdown products of a bruise, estimated two weeks earlier. Hemorrhagic polyps sometimes re-bruise intermittently. Open phase of vibration, strobe light, at low vocal pitch. Vocal cords are coming into vibratory contact, beginning of closed phase. Closed phase of vibration, strobe light, showing that the polyp shifts to upper surface of the vocal cord. Standard light, close-up view of a hemorrhagic polyp of the vocal cord. Strobe light, open phase of vibration. Strobe light, closed phase of vibration. Same patient, one week after surgical removal of the polyp, standard light. Strobe light, open phase of vibration. Compare with photo 2. Note here that the vibratory amplitude of both cords is the same, showing that the operated cord remains flexible. Strobe light, closed phase of vibration. Compare with photo 3; the vocal cords now match much better during voicing, and the voice is completely normalized. Seven months later. Strobe light, closed phase of vibration. The patient feels his voice is normal, and swelling checks don't indicate any impairment. Partially closed phase of vibration, strobe light. Abducted breathing position after vocal cord microsurgery, standard light. Note that the right cord is normalized, the capillary ectasia on the left is smaller, but persists in spite of spot-coagulation. A simple pulsed-KTP laser procedure in the videoendoscopy procedure room abolished this residual lesion. Pre-phonatory instant, standard light, showing excellent match. Oscillatory ability entirely normal into extreme upper range in this professional singer. Note the differing patterns of capillary ectasia—fine “stream;” meandering “river,” and “pond.” Brilliant white areas are reflection of light; more indistinct submucosal white area right cord raises question of possible cyst (arrow). Strobe illumination better reveals the polypoid component of the swellings. Some mucus accumulation, especially posteriorly. One week after surgical removal, prephonatory instant, at C5 (523 Hz). Note the gap between the cords, much the same as preoperatively in prior photos. Phonation also at C5. Vibratory blur is equal bilaterally, and upper voice dramatically restored, even before “surgical laryngitis” has resolved. Young woman who fits the "vocal overdoer" profile and who has been hoarse for many years. The hoarseness has become intolerable in the past 2 months. 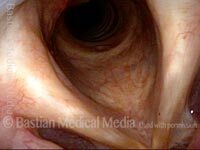 At much closer range, with the right polyp (left of photo) displaced with inspiratory phonation to show the considerable left cord (right of photo) injury. Note large vessel coursing along the right polyp (left of photo) and the capillary prominence within the left vocal cord (right of photo) injury as well. Note as well the bruising distant from the origin and yellowish discoloration of partially resolved bruising. At F3 (175 Hz), open phase of vibration. At this pitch the polyp flutters and adds a second low rumbling sound to the main pitch she is singing. The patient sings B-flat 5 (932 Hz) using only the posterior segment with vibration indicated by bi-directional arrows. Young music teacher and choral director with chronic hoarseness for more than a year. Note bilateral chronic injuries, and also recent bruise of the right cord (left of photo). Closeup of injuries and their "refusal" to let the cords approximate, when attempting (unsuccessfully) to sing a high pitch. 7 days after vocal cord microsurgery, the voice can already pass for normal quality and capability. Compare with photo 1. Prephonatory instant at high pitch, showing that the match of the cords is already markedly restored. The tiny elevation will disappear with further healing. Closed phase of vibration at A-flat 3 (208 Hz), seen under strobe light. This open phase shows what is equally important: that both cords display equal vibratory flexibility; that is, there is no stiffness or scarring. This man also has clear, normal falsetto voice: closed phase of vibration at A-flat 4 (415 Hz), again showing dramatically improved match. Again more important is evidence of equal mucosal flexibility between the two sides, as seen in this open phase of vibration, at the same pitch. Kindergarten teacher with severe double pitch and hoarseness. Right vocal cord hemorrhagic polyp and scattered ectatic (dilated) capillaries. Attempting to produce voice with interference and “rattling” of the polyp. A few weeks after surgical removal of the polyp, and spot-coagulation of the dilated capillaries. Closed phase of vibration at high pitch. Much improved match and normal high voice. Broad-based residual swellings are likely chronic from many years of teaching kindergartners. This large polyp resulted from an episode of extremely aggressive voice use six months earlier. In this photo, one cannot tell if the point of attachment covers the same area of the circumference of the lesion, or if it is smaller. Here, the examiner has elicited rapid inspiration. The rush of air inward pulls the polyp inward and downward, revealing its stalk or peduncle. The attachment is indicated by the dotted line. The vocal cords are closed while continuing to draw air in. The polyp is now hidden below the point of closure of the cords. When voice is produced, the polyp flips upwards between the colds and now lies on the upper surface of the vocal colds. None of this movement could happen if the polyp were not pedunculated. A week after removal of the polyp. Compare with photo 1 to see that the “wound” (area of vascularity) is far smaller than the diameter of the original polyp (dotted line), showing in a second way the idea that the attachment had “pinched in” to a stalk. Many months after formation in a low-voiced male, this hemorrhagic polyp has become mobile. Here, inspiration draws the polyp downward towards the undersurface of the left cord (right of photo). 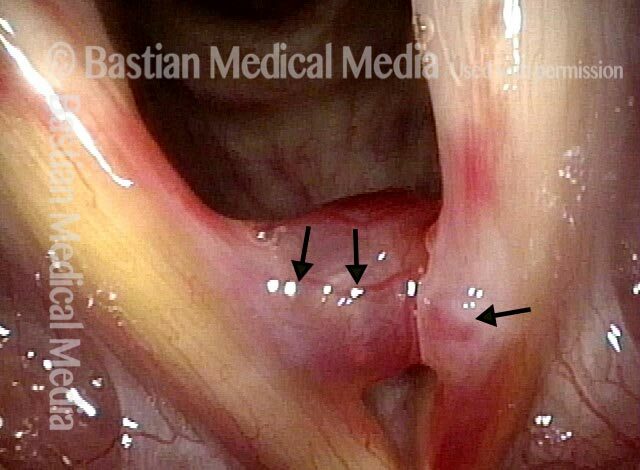 When the original bleeding event occurred this polyp would have for some months been more fixed at the free margin, pressing into the left vocal cord (right of photo) at the point of the arrow on the left side (right of photo). As the vocal cords close to produce voice, the polyp rides upwards. The dotted line circles a slight depression, and shows where the polyp originally pressed inward against the left cord (right of photo). A week after vocal cord surgery, the operated side (left of photo) shows residual bruising at the base of the ~ 5mm “wound.” The dotted line on the left cord (right of photo) shows the slight concavity sustained by months of pressing against the polyp, especially during the time before it became pedunculated. At a prephonatory instant, mild post-surgical swelling of the right cord (left of photo) is seen as subtle convexity. 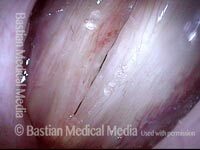 But the slight concavity caused by the pressure of the polyp on the left (unoperated) vocal cord (right of photo) is seen even more clearly (dotted line). During phonation under standard light, the mild concavity of the left (unoperated) vocal cord (right of photo) is seen more clearly. At A4 (440 Hz) under strobe light, closed phase of vibration. Open phase of vibration at the same pitch. Both sides vibrate equally well, but the operated cord has a straighter margin than the unoperated one. Watch the story of a young man with a hemorrhagic vocal cord polyp. 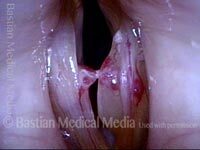 Listen to his voice and see his larynx both before and after surgical removal. This entry was posted in Multimedia Encyclopedia and tagged Disorders, Photos, Videos, Vocal cord vibratory injuries, Voice & other larynx disorders by admin. Bookmark the permalink.